The 10-story complex on Atwells Avenue would far surpass the 45-foot height limit imposed by city ordinance in that neighborhood. PROVIDENCE -- The Zoning Board of Review last night voted unanimously to relax zoning restrictions to allow construction of a 10-story luxury condominium building on Federal Hill despite misgivings about its height. The decision came after board members were presented with clashing visions for the future of Federal Hill at a public hearing at City Hall. Premier Land Development of Providence displayed a 43-unit condominium building with ground-floor retail that it wants to build on a site bounded by Atwells Avenue and Knight and Marcello streets near Holy Ghost Church. Witnesses for the developer and advocates said the project is well-conceived, good-looking and would enhance the Hill and boost nearby real estate values. But critics said it would be grossly oversized, towering over the one-, two- and three-story buildings that typify Atwells Avenue and most of the Hill. Rep. Steven Costantino, D-Providence, urged the board not to diminish the things that give the Hill its romantic character and historical cachet, such as its modest scale and older buildings, by allowing such a tall and massive structure. Costantino's district includes the Hill, and his family owns a couple of food businesses nearby at DePasquale Square. The zoning ordinance limits the height of buildings in the area to 45 feet, but Premier Land Development wants to put up a building of 145 1/2 feet. It sought five exceptions to the zoning ordinance, including a waiver of the height limit. In a memorandum, the city Department of Planning and Development asked the board to deny the application because the developer does not meet the standard of a hardship required by law for approval. Further, the department declared, the developer cannot show that its request does not arise merely from a desire for greater profit. However, buildings of greater height and density "would work" on Atwells, especially because of the way the street slopes at its western end, at the project site, the department said in the unsigned memorandum. If the board does grant the exceptions, the department urged that the board make them contingent on approval by the city Plan Commission because of the complexity of the project and the desirability of more public input. Sandra Carlson, Zoning Board chairwoman, said the department's opinion should be rejected out of hand because it asserts facts without having the benefit of the evidence presented at the public hearing that the board conducted last night. Department staff reviewed the application and met with the developer's representatives before the hearing. Richard A. Licht, lawyer for Premier Land Development, said the developer modified its plans to accommodate department suggestions to make the project more pedestrian-friendly and to improve its landscaping. Jeff Lykins, project architect, and Thomas O. Sweeney, a real estate expert hired by Premier Land Development, testified at the hearing that the developer needs to have a building with more height in order to make the project financially feasible. There are certain fixed expenses that the project would have to carry even if shorter, they testified, such as the extra cost of building two levels of underground parking designed to meet the minimum-parking requirements of the zoning ordinance. Lykins said aspects of the structure's design, such as the windows, aim "to set the building apart" and represent the kind of fixed cost that would make a shorter building with fewer dwelling units less financially feasible. In response to a question by Zoning Board member Scott Wolf, Lykins said six stories would be insufficient to "provide a building of this quality, to be a catalyst for Atwells." He said he designed "a very inviting building" with "strong cornices" and "classic proportions in harmony with the traditional properties of Providence." John Mancini, a principal of Premier Land Development, gave the board a petition from the owners of 22 parcels in favor of the project that he said represents 90 percent of the real estate within a 200-foot radius of the site. Also submitted were letters of approval from City Council President John J. Lombardi and Sen. Frank Caprio, D-Providence, each of whom represents the area in which the site is located. In opposition, alarmed by the scale of the project, are the Providence Preservation Society, Federal Hill Community Coalition and West Broadway Neighborhood Association. The Federal Hill Neighborhood Association presented a petition from neighborhood residents against the project. "This is a building that belongs on one of (developer and former mayor) Joey Paolino's surface parking lots downtown," said Raymond Perreault of 178 Knight St.
Several critics said sponsors of other large-scale projects for Atwells are waiting in the wings, hoping that the condominium building will be the precedent they need to justify their projects. "This is the first of what may be a runaway train" of developments that will permanently dilute the historical nature of the Hill, Costantino warned. What is on this site now? Part of it is vacant. Part of it has a two story commercial building. The commercial building is also currently vacant. If the commercial building were fixed up it could look nice, but I'm not shedding any tears over losing it. Some people are concerned about the height precedent, I say bring it on! There are a few housing projects in close proximity that exceed this proposed building in height (60s 70s monstrosities). There is a church on the opposite corner, and I would hope that the sightlines to it down Atwells Avenue will be preserved, I think they will be. This project could serve as a good bridge to connect the main section of Federal Hill to new developments taking place in mill buildings on the other side of Routes 6/10. I have a better rendering of the building from the print edition of the Journal, I've been meaning to scan. Current Site, seen from opposite direction. What you really need is some kind of pedestrian-friendly, shop-lined "bridge" from Downtown (Downcity?) to the Federal Hill entry arch on Atwells. The depressed freeway is a psychological and physical barrier. Any chance of this happening? Not anytime soon. Cianci had an urban renewal plan called Three Cities which called for major redevelopment in three parts of the city. One part was called Westminster Crossing and would have put a deck over much of Route 95. The whole Three Cities scheme was pie in the sky from the start, there was absolutely no money for it, plus we have plenty of spaces within the city that already need to be develped (Capital Centre for example), never mind creating whole new frontiers. There is a much scaled down version of Westminster Crossing that is in idea form, that calls for creating small vendor stalls on one side of the Westminster Street Bridge, and an architectural wall on the other side (keeping it open to traffic in the middle). A similar scheme could be put in place at the Atwells bridge. Though the Westminster Bridge could support this without reengineering the structure (there is a suplerfluous traffic lane that would be taken for the stalls), the Atwells bridge would need an extended deck to set up a similar structure, and would therefore me more expensive to pull off. There is hope that we could see a small skyscraper on the former Gulf gas station site across from the Holiday Inn. Creating better decorative hardscape (i.e. false arches) on the Atwells and Broadway bridges could be part of that future development. Andres Duany held a design charrette in Providence in March which outlined a lot of these ideas. now that there seems to be some actual discussion going on here, thought I would jump in! Welcome, eltron, glad you decided to jump in. I know its been talked about somewhere else around here, but if you want to see a BAD looking building, take a look at the renderings for the condo tower proposed for Atwells and Knight. Complete MONSTROSITY. 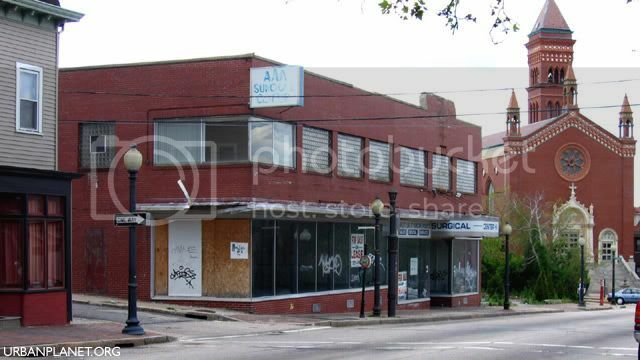 Can't wait to see what's acutally proposed for the Rialto Furniture site as well. Hoping its better than this. Please do weigh in, and maybe we can speculate more about the Rialto project over there, I really have no idea about it. Besides, there are already a few high rise structures on the Hill.. Parenti Villa and Dominican Manor.. sp? I moved a few of the comments from the other thread here, since this is what we were talking about. Again, I think we have a poor rendering of what may or may not be a good looking building, but I have no problem with the height, I would not like to see everything lining Atwells suddenly sprout an additional 8 floors, but if there is an unsightly hole in the streetscape, I'd like to see it filled in. I think this is a good bracket for Federal Hill, a big bang of an entry into the neighbourhood. I would actually like to see the city focus residential development on the hill, in some of the areas off Atwells that are vacant. There's a lot of vacant lots north of Atwells, between Cedar and West Exchange. Also Federal Street east of Dean. And there's some holes that need filling in along Spruce Street. Federal Hill is a great neighbourhood in that it has terrific proximity to downtown. The city should jack up the population density as high as it can go, and provide super-frequent transit into downtown. I think all of the points here about this building are valid ones. I am absolutely 100% NOT opposed to development here. The real problem is the zoning board of appeals being used to grant favors to some while throwing up impossible impediments for others, completely arbitrarily. This building breaks not just a few, but almost EVERY zoning regulation for that site. The presentation they gave was vague, and the zoning board ignored Planning and Development's recommendation to turn down their variance application. If this is the case, why do we even have zoning, or a dept. of planning and development at all? Height. I'm all for height, but in this location, I'm very worried about the effect this building is going to have on the church next door, which is a lovely example of architecture, perched as it is on top of The Hill. This building will tower over it. In this location, I think it should be 6 stories, tops (still 2 stories over what zoning allows). I think the design is derivitive and pretty poor. The materials and window details look chintzy and the facade, IMHO, lacks any of the richness that the better buildings in Providence have (even GTECH). The awkward turrets? An obvious and not really great theft from the Cranston Street Armory. It looks like the Citizens Bank building plopped down on the hill, and I think we deserve better. Why should the GTECH building undergo all that review, and this one has nary a presentation to the neighborhood? I think someone mentioned the slums down the street from this at the corner of Knight and Penn...I think all of this would be tempered if we had some sort of linkage system or inclusionary zoning that provided some affordable housing or other neighborhood improvements. Say we give the builder's of this everything they want, in exchange, they tear down one of the slummy buildings at Knight and Penn and build 6 units of really nice affordable housing. Then we've gotten somewhere. We are no longer in a "development-at-all-costs" mode here; I think we can aspire to be a little more discriminate in what we get in our neighborhoods, and move ourselves into the more progressive class of cities. Anyway, sorry for the rant. I'm very much up for discussion on any and all of these points, so please, fire away! Nice rant! I have some comments, but I'm on my way out the door. I'll post some more later. Looks like great minds think alike. Those pesky inane zoning 'laws' are part of what is driving the height of this project. The developer needs to provide a certain amount of parking per unit, and in order to build a garage to contain all those cars, he needs a lot of units to offset the cost of the garage, a classic catch 22. The new zoning laws should allow for less parking per unit in high density, good transit areas. But the state needs to fund RIPTA to ensure that those transit corridors exist, and remain. You can sell someone on a condo on Federal Hill by telling them about the great transit, the trolleys rock my world, I love them, but every year RIPTA threatens to cut them. We can't expect people to pay good money for condos, without parking if they can't be sure that they can rely on the transit being there. And a good public garage that sold monthly spaces on Federal Hill wouldn't hurt either. I would really like the city to develop a website for development proposals and force the developers to post good renderings on it, so the public can review and comment on them. This rendering is crap first off, what materials are those, I assume the body is brick, but what is the rounded bits, copper? What's the turrets, stone, metal, plaster-of-paris, who knows? And the balconies look like they are covered in tar paper. I like the building, but I wish I knew what they were making it out of. I think design review is all well and good, but the design by comittee that GTECH was subjected to just doesn't work, I think we can all find one good thing to say about the GTECH building, but we would all probably say a different thing. A good architect is an artist, s/he shouldn't be nit-picked to death by comittees. If we could come up with some sort of guidelines for each neighbourhood, that might help things. A developer that wanted to get greenlighted quickly and easily would follow the guidelines, one that wants to go out of the box would be subjected to more rigorous review. There would be a mechanism for developers to push the envelope, but the envelope should be clearly labeled so that developers know what is expected of them. I'm all for this idea, but I wonder how much clout the city really has right now to make this happen, this works in Boston (though they really need to be pushing for more affordable units per project) but I don't know if too much pressure in Providence would make a developer just decide to go elsewhere, screw this I'll build in Warwick or North Providence where they don't have all these rules. Now if we had a statewide affordable unit linkage program, then developers wouldn't be so quick to go elsewhere. I have no doubt that this developer was well aware that new zoning laws were about to be written, and it's a pretty good bet that this building at this location will not be allowed under the new rules, so he obviously has some friends in high places (or not so high places) that did some work to make this all happen, and that is the key problem in Providence and Rhode Island as a whole. Everything has to be made transparent, no more of this backroom dealing. If that is going to continue to be the way things are done in Rhode Island, than our future isn't as bright as we all would hope. The thought that those rounded ends could be copper hadn't even crossed my mind. I suppose it really is a crappy rendering that doesn't give us any real expectations. I had assumed somebody did crappy luster work on the texture and made the brick shiny. Copper would be kind of cool. Copper would be kind of cool. It would be, but I doubt that's what it actually is, you just can't tell what it is from the rendering. Mre likely than copper would be that faux copper green sheet metal that's so popular now. The real problem is the zoning board of appeals being used to grant favors to some while throwing up impossible impediments for others, completely arbitrarily. The zoning board is awful.. I know the developer for this.. Its the same group who is building the condos on Fruit Hill.. This guy gets to do whatever he wants.. Its pretty amazing how they bend over for him... Tons of pull..
Until a certain group of landlords in the Penn/Tell area decide to either sell or get with the movement, that area will never get better.. Interesting. Actually, the two worst buildings at Penn and Knight are on the market and have been for a while in the low/mid $300K range. The worst properties in the neighborhood just seem to turn over amongst the absentee slumlords and continue causing problems (like the murder in one of them last summer). Its a constant problem and it will take serious effort to take care of it. In fact, tonight, I am meeting with Councilman John Lombardi and a group of neighbors about the monstrosity at 91 Vinton, a house that is bringing down the whole street. It is currently owned by a jackass in a Navigator, has 88 housing violations (no joke) and has been in housing court for years, but since it is held under a dummy owner and address, nothing can or has been done through that route. Now, a woman and her three boys have moved into this house, (very interesting rumours going around about the relationship between the owner's wife and this woman, though unsubstantiated) and the house has become the magnet for the teenagers of the neighborhood to hang out and "break stuff" in their boredom, like people's cars. People are tired of the petty vandalism and general debauchery, so its time to hold this owner accountable. I'm hopeful. To get back on topic, yes, this stuff has to happen naturally, ie, owners and neighborhood stakeholders have to take it upon themselves to make change. But, government can and should play a significant role in this, but while they are busy rewarding their developer friends, they are enabling the same old crap to go on and on just down the street. ok, enough of this ramble. Anyway, I am a real estate developer myself (albeit for a non-profit), so I understand the realities of the market. Everyone has to make their "living." But there are better things to aspire to here. I think linkages CAN be made between the condo towers and Penn or somewhere else, just like there were significant linkages at Rising Sun, at the Pearl Street Lofts, at the Foundry. Anyway, its an interesting time for Providence! This rendering is crap first off, what materials are those, I assume the body is brick, but what is the rounded bits, copper? What's the turrets, stone, metal, plaster-of-paris, who knows? And the balconies look like they are covered in tar paper. I like the building, but I wish I knew what they were making it out of. This is a good point - the design by commitee approach that GTECH went through was not ideal. But what I take exception to is that at least it recieved some review, imperfect as it was. I bet most would agree that the GTECH building is better than originally proposed as a result of the review. The real problem is that some areas of the city get the shaft with respect to oversight. Take the new Life Sciences Building at Brown...that building underwent significant neighborhood review and had a full-size mockup of wall materials put up before construction started. I'd bet a million bucks this building on Atwells will get none of that. Another is the Dunkin Donuts (!) on Gano St. That standard DandD underwent all sorts of changes...you can bet that a DandD on Broad Street or Academy or Cranston St. is not going to get the same attention. Double standard? Not sure, but I'm definitely suspect. Actually, Rhode Island already has a type of affordable linkage program - the Low and Moderate Income Housing Act. Interestingly, Providence (along with Pawtucket, Central Falls, Warwick, and Woonsocket-all urban) are the only communities in RI exempt from it, because they have over 10% of their housing stock "subsidized." Developers in suburban communities are already using this like crazy to get around zoning bylaws and building HUGE developments with 20% affordable housing. Barriers to building are the same everywhere, if not more intense in suburban communities, but developers are overcoming this in the suburbs through this linkage program. Developers are surely no longer averse to developing in the city. I think giving developers in Providence an automatic density bonus in exchange for units or payment-in-lieu would REMOVE barriers, because the process would be so much more predictable for developers. Take this Atwells project - alrighty, you want to build 43 units, we (the city) want you to build 43 units, you can definitely do that, even though zoning only allows 30, as long as you give us 6 affordable units, or $600k (not that much for a $15 mil. 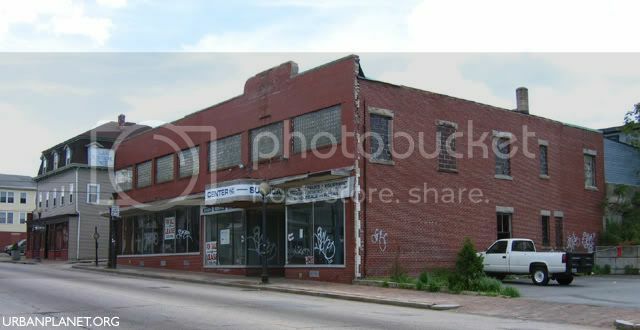 project when you GAIN predictability and time), which we would then use to buy the two buildings at the corner of Penn and Knight, give to a non-profit developer for a dollar to redevelop. Net gain to the city: 43 luxury units and 12 affordable units, the elimination of neighborhood blight, and an overall healthier city. Rising Sun, Pearl Street, and Rau Fastener, ALL had linkage provisions in their approvals and dealings with the city. Why this one should be any different, I am not sure. I agree and admit I for one do not like the design / color much at all. Took some photos of the site today. Nothing going on yet. Bidding on this job will close in September. Uh, I think this project should probably be moved to "In Progress" as the AAA Surgical building is very much now demolished. REALLY?! I should go out for a walk more often.